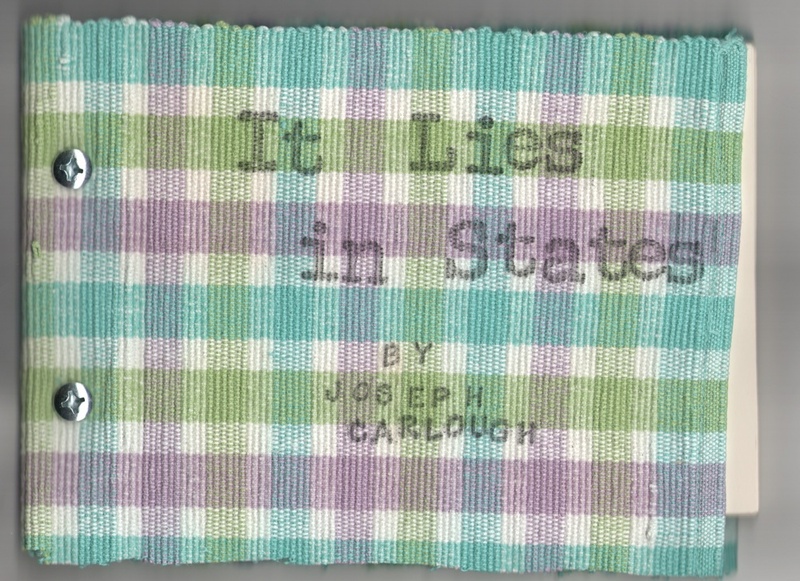 It Lies in States is a singular experience of America, each of the 50 states existing as a poem, including quirky sidenotes, comical anecdotes, surreal visions, and honest experiences. The author, Joseph Carlough, formats, prints, and binds each copy in his home base in New Jersey. The book includes illustrations by Alyssa San Valentin. Each cover is recycled from an old scarf or placemat, each book is bound with nuts and bolts, and the pages are a fine ivory 32lb. cottonstock. It Lies in States can be ordered through Displaced Snail Publications’ Etsy account, http://displacedsnail.etsy.com, or through the author’s website, www.josephcarlough.com. This entry was posted on Monday, January 3rd, 2011 at 11:24 pm and is filed under Announcements, Four and Twenty Author Release. You can follow any responses to this entry through the RSS 2.0 feed. Both comments and pings are currently closed.